A-HOTEL.com - Luxury and cheap accommodation in Gnilitsy, Russia. Prices and hotel, apartment booking in Gnilitsy and surrounding. Surrounded by a pinewood forest, this hotel is located a 10-minute drive to Nizhny Novgorod International Airport and just 1 km from the nearest ski lodge. It offers free Wi-Fi in public areas and free transfers to Strigino Airport. Located in Nizhny Novgorod, 21 km from Nizhny Novgorod Stadium, Forest River Cottage offers a living room with a flat-screen TV, and a garden with a barbecue. The property is 19 km from Nizhny Novgorod Bus Station and 20 km from Nizhny Novgorod Fair. Set in Nizhny Novgorod, 19 km from Nizhny Novgorod Stadium, Gostiniy Dvor features a restaurant, bar and free WiFi throughout the property. Guests can enjoy the on-site restaurant. Boasting a bar, Hotel Kluch is located in Nizhny Novgorod and is 24 km from Nizhny Novgorod Stadium. Located around 22 km from Nizhny Novgorod State Academic Opera and Ballet Theatre, the hotel is also 22 km away from The Annunciation Monastery. Hotel Complex Novinki has ski-to-door access and a terrace in Nizhny Novgorod. The property is around 24 km from Nizhny Novgorod Stadium and 22 km from Nizhny Novgorod State Academic Opera and Ballet Theatre. Set 18 km from Nizhny Novgorod Stadium and 16 km from Nizhny Novgorod Bus Station, Apart Hotel on Malyshevskaya 109 offers free WiFi and units equipped with a kitchen. Offering garden views, all units come with a washing machine, kettle, a satellite flat-screen TV, ironing facilities and a living room. Kvartira is an accommodation situated in Nizhny Novgorod, 17 km from Nizhny Novgorod Stadium and 15 km from Nizhny Novgorod Bus Station. Guests staying at this apartment have access to a fully equipped kitchen and a balcony. Located in within a 7-minute drive of Nizhny Novgorod International Airport, Russky Capital Hotel features comfortable rooms with a flat-screen TV. Russky Capital Hotel provides air-conditioned guestrooms fitted with simple furnishings. This hotel is located just a 5-minute drive from Strigino International Airport in Nizhniy Novgorod. Free Wi-Fi, free parking and a 24-hour reception are featured at Atlantiс Hotel. 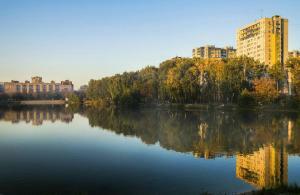 Located in Nizhny Novgorod, Bulvar Yuzhny Apartment is within a 10-minute walk of Park Kultury metro station. features free WiFi. Квартира около Аэропорта is situated in Nizhny Novgorod. This apartment offers accommodation with free WiFi. Apartment on Yanki Kupaly is an accommodation set in Nizhny Novgorod, 15 km from Nizhny Novgorod Stadium and 13 km from Nizhny Novgorod Bus Station. The property is 14 km from Nizhny Novgorod Fair. Set 16 km from Nizhny Novgorod Stadium and 14 km from Nizhny Novgorod Bus Station in Nizhny Novgorod, HomeHotel bul.Yuzhnyi 18 offers accommodation with a kitchen. Set in Kusakovka in the Nizhny Novgorod region, House on Polevaya 4B features a garden. This holiday home features barbecue facilities as well as a terrace. Boasting city views, HomeHotel Молодежный 38/2 features accommodation with a balcony, around 15 km from Nizhny Novgorod Stadium. This property offers access to free WiFi. Set in Nizhniy Novgorod, this air-conditioned apartment features free WiFi. Park Kultury Metro Station is 850 metres away. This hotel is situated just a minute's walk from Park Kultury Metro Station in Nizhny Novgorod. Avtozavodskaya Hotel offers elegant rooms and features a 24-hour front desk. Apartment at Yuzhnoye shosse offers accommodation in Nizhny Novgorod, 15 km from Nizhny Novgorod Stadium and 13 km from Nizhny Novgorod Bus Station. The apartment is 13 km from Nizhny Novgorod Fair. Located in Nizhniy Novgorod, Country House offers en-suite accommodation with free WiFi access throughout. The property boasts an on-site à-la-carte restaurant and a bar, as well as sauna facilities and a 24-hour front desk.